Celebrate by reading all about one of the most popular entertainers of the 20th century! Don't know much about the King of Rock and Roll? Are you the Elvis expert always looking for new material to read? 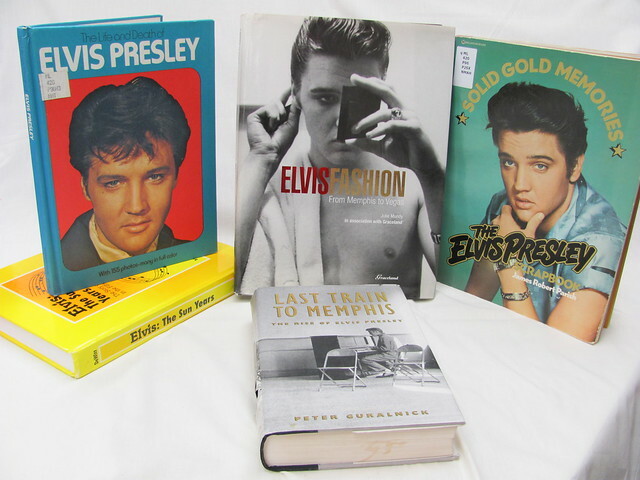 Libraries branches have a multitude of books which feature Elvis Presley. Read and learn all about Elvis! Elvis, the Sun years : the story of Elvis Presley in the fifties by Howard A. Dewitt. Ann Arbor, MI : Popular Culture, Ink, 1993. Last train to Memphis: the rise of Elvis Presley by Peter Guralnick. 1st ed. Boston : Little, Brown, and Co., c1994. Elvis fashion: from Memphis to Vegas by Julie Mundy, in association with Graceland. New York : Universe, 2003. The Elvis Presley scrapbook by James Robert Parish. New York : Ballantine Books, c1975. The life and death of Elvis Presley. Tulsa, OK : Harrison House, distributed by Crown Publishers, c1977. Next Post Happy Birthday Smithsonian Institution!